Find resources to help you implement Optiflow™ Nasal High Flow in your hospital. For further information, contact your local Fisher & Paykel Healthcare representative. What flows should I start with? Each patient is different with their own unique respiratory demands, but a common principle in using Optiflow Nasal High Flow is meeting or exceeding the patient's peak inspiratory demand. The adjacent table lists starting flows and flow ranges used within important clinical studies. Additionally, Parke et al. conducted a study to describe how oxygen therapy is prescribed, administered and monitored in New Zealand and Australian ICUs. In the protocols in use in 16 ICUs, the mean starting flow rate for Nasal High Flow was 38L/min (SD 5L/min, range 30-50L/min) and the mean maximum flow rate was 57L/min (SD 12L/min, range 35-70L/min). How much pressure is generated? It should be noted that Nasal High Flow is a flow-based therapy, rather than a pressure-based one, and as the nasal interface is unsealed, it is difficult to measure the exact pressure being delivered to a patient. In addition, a number of clinical studies suggest an increase of 0.5-1 cmH2O per 10 L/min, as shown in the graph below. When should I see the effects of Optiflow? Sztrymf et al. 2011 associated Optiflow with sustained and beneficial benefits on oxygenation and clinical parameters in patients with acute respiratory failure. 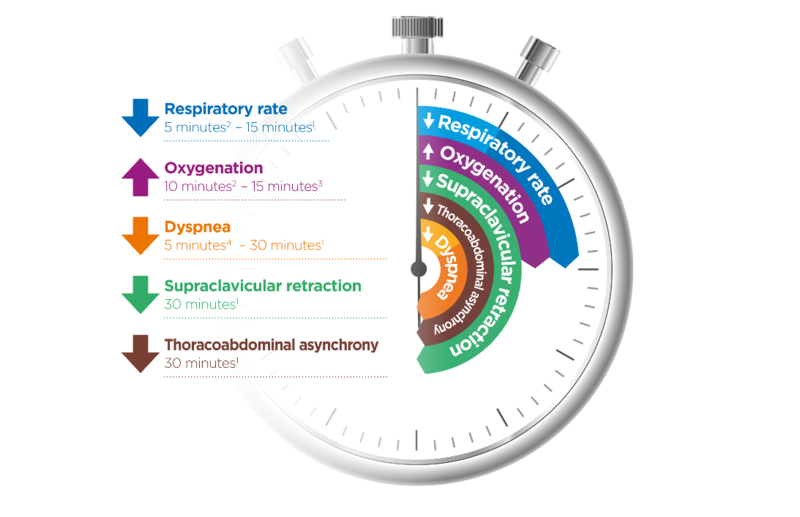 His study showed that after 15 minutes of initiating Optiflow, a significant improvement is observed concerning respiratory rate and oxygenation, while dyspnea score, clinical signs of respiratory distress, and heart rate after 30 minutes. Similarly, Rittayamai et al. 2013 showed significant improvement in post-extubation patients and found that as early as 5 minutes after initiating Optiflow, improvement in respiratory rate was observed and heart rate, oxygenation, and dyspnea score after 10 minutes. These studies are suggesting a time window to observe how a patient is responding to the therapy. Titrate flow and/or oxygen to meet the desired outcome for the patient. 2. Rittayamai et al. Respir Care, 2014. 3. Lenglet et al. Respir Care, 2015. 4. Rittayamai et al. Respir Care, 2015. Optiflow provides heated humidified air, and oxygen (21% to 100% as required) at a flow rates up to 60 L/min. Optiflow promotes key mechanisms of action – reduction of dead space, dynamic positive airway pressure, airway hydration, patient comfort and supplemental oxygen (if required). What effect does pressure delivered by Optiflow have on the airways? What effects does dynamic pressure have? Flow dependent pressure supports easier inspiration and prolongs expiration, thus improving the breathing efficiency. Dynamic positive airway pressure delivered by Optiflow may be associated with several clinical benefits including reduced work of breathing, and improved oxygenation. 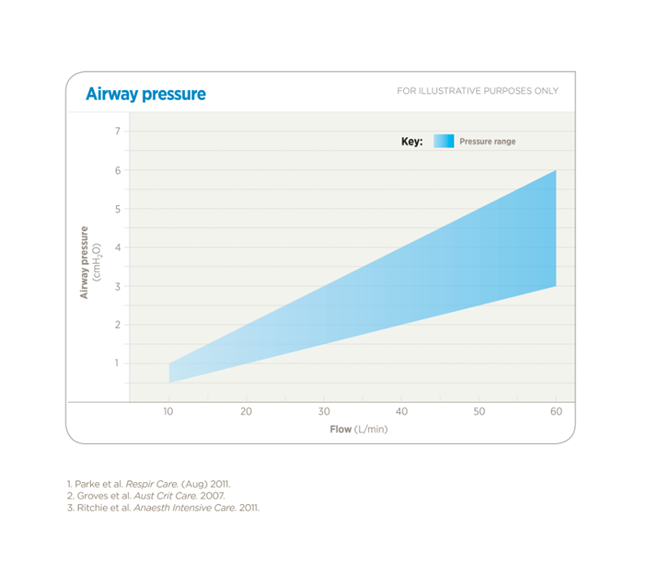 The amount of positive airway pressure is dependent on a number of variables including: the patient’s mouth being open or closed, the size of the cannula relative to the nares, rates of gas flow and the anatomy of the each patient. What effect does humidity have on the airways? Humidification provides better tolerance and improves lung mucociliary clearance. 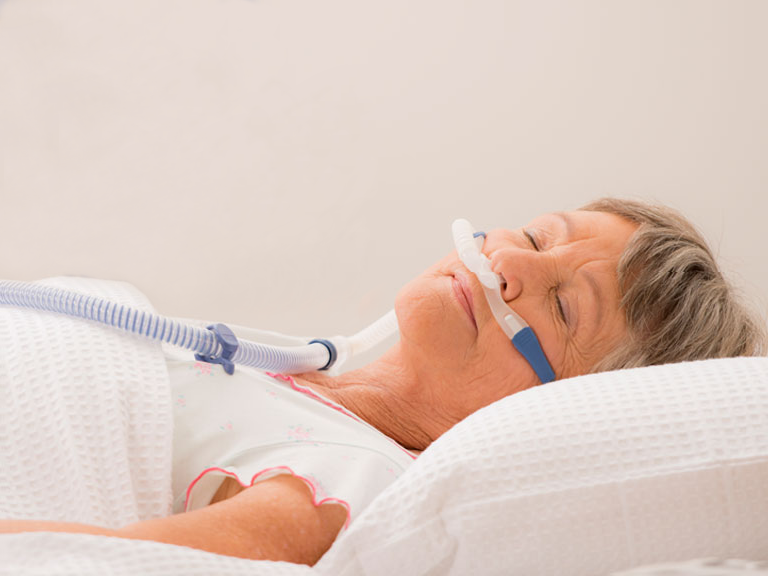 How can patients tolerate flows up to 60 L/min via a nasal cannula? Standard nasal cannula delivers cold dry gas. In contrast, Optiflow delivers conditioned gases (37 °C with 44 mg/L H2O) across a range of flow rate up to 60L/min. 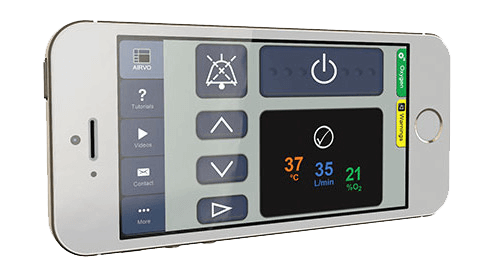 Clinical evidence has found that Optiflow is associated with improved comfort and patient compliance. Additionally, the wide bore of the nasal cannula is ergonomically designed to assist with tolerance at higher flows by dispersing the gas over a wider surface area. Let us customize an evaluation in your unit.